NASA is exploring experimenting with the "Hammer," which would either ram the asteroid out of the path of Earth or nuke it. NASA is examining a new weapon that could be used to stop an asteroid speeding toward Earth, and its deploymen twould be quite the epic sight. Basically, scientists think they might be able to actually nuke a huge rock in outer space and knock it out of its potentially humanity-ending trajectory. 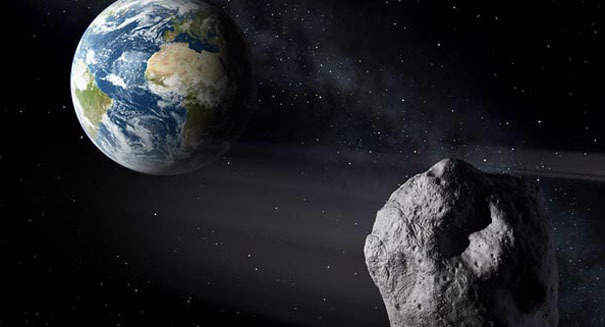 NASA and the National Nuclear Security Administration are calling it the Hammer, which stands for Hypervelocity Asteroid Mitigation Mission for Emergency Response. It would be a 30-foot-tall shuttle that could act as a batteirng ram or carry an atomic bomb. NASA has its eye on Bennu, a gigantic asteroid that has just a 1 in 2,700 shot of hitting the Earth in 2135, but still an uncomfortably high number. And considering the fact that every extinction event known to us on Earth was caused by an asteroid hitting the planet, it seems prudent to expect that eventually we will be once again hit with an asteroid at some point, even if it may be many thousands or perhaps millions of years in the future. Bennu is a very big rock, stretching approximately 1,614 feet in diameter, or almost a third of a mile. It was discovered in 1999 and is the target of the OSIRIS-REx mission, which will seek to obtain samples of the asteroid in 2023. If it struck the Earth, it would release 80,000 times the power of the nuclear bomb dropped on Hiroshima.